Reviewed : Slots – Pharaoh’s Way. Addictive Personalities Beware. by Mark — in iOS App Review.Leave a Comment on Reviewed : Slots – Pharaoh’s Way. Addictive Personalities Beware. When this game came up on my review list, I genuinely thought “Oh great, yet another slots game”. But yet on I went to download the game. After about 10 mins of playing the game I was hooked. Slots games where you aren’t playing for real money always run the risk of being boring, but after playing Slots – The Pharaoh’s Way, I am glad that I wasn’t playing for real money otherwise I’d be broke. The graphics are great and the premise of collecting diamonds to appear in the slot to move up the levels make this an interesting game to play. 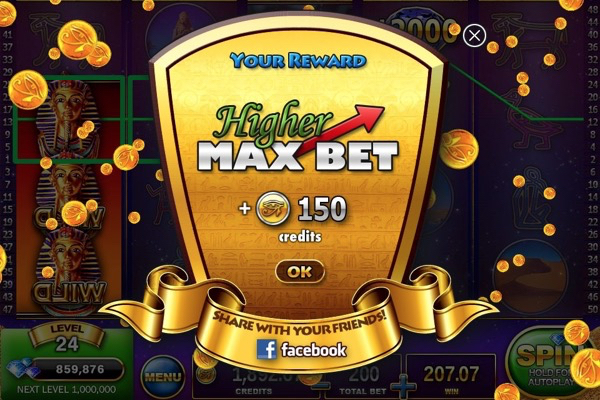 Every new slot brings new Bonus levels, and each new level allows you to up your maximum bet and the more you bet, the more diamonds you collect. The fact that the bonuses are different gives this game the variety that keeps things interesting and keeps you wanting to play. If you click on the option next to the spin button you have the opportunity to double your winnings by guessing the cards that come next, you can either guess by colour or suit, there is a feeling of satisfaction when you get it right that I think the developers may have been counting on. It is a bit of a bummer when you get it wrong though. Every ten levels you get a new slot to play, the second slot is a little boring as it only has three spinners but the rest still has me hooked. Before I knew it I’d been playing the game for hours and I’m currently on Level 32. I have flipped through the map that is available to see and there seems to be more surprises after level 50 and I can’t wait to get there. 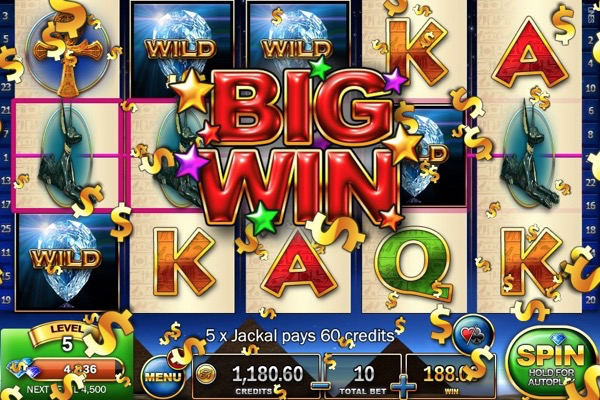 The Big Win Graphics take you by surprise and give you a little giddy feeling. It is probably too easy to win on this game, but the entertainment of the game puts that to the back of your mind and you keep wanting to play. The drawbacks are obviously that some slots are not as great as the others, and that the fact that when the slot changes the amount of diamonds you win also changes but you can up that again by upping your max bet. Aside from those couple of points I would definitely recommend this game and will be playing more of it. Conclusion – good game overall with a few drawbacks but not enough to make me not want to play it.